It is an icy morning. Even if roads were treated, your car or sidewalk might be icy. That can take a while to thaw even if you have rain. The Winter Weather Advisory remains in place this morning to consider what is falling but also slow melting. As of 6 AM Maryland schools closed include Cecil, Harford, and Carroll Counties. Many others are delayed and I expect the reevaluation may be worth paying attention to closely. We have a mix of freezing rain, sleet, and snow. The radar is having trouble identifying the transition zones properly, so I have included many area temperature maps. There will be a slow thaw today, but the wintry mix will continue. Then, snow and ice will redevelop tonight and a Winter Storm Watch goes into effect for many areas after 4 PM. There is a lot of info to share, so I have many sliders in this post. They include temperatures at 6 AM and a timeline forecast through today. I have the MDOT interactive mapping of where the plows are located. I also added multiple radar simulations to compare where the snow and ice will extend later today and tonight. This will not be perfect as a few miles can make a big difference. So you reports on social media will help everyone. 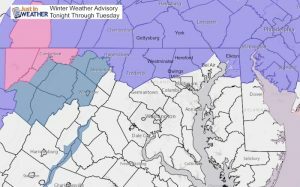 Winter Storm Watch 4 PM through Tuesday morning: Northern Maryland (Northern Harford and Baltimore, Carroll, Carroll, Frederick, Washington, Allegany) and southern PA (including York and Lancaster). I annotated where I saw the transition zones. Your reports on social media will help everyone continue to track. From Facebook on iPhone you may need to open in Safari. The thaw may vary within just a few miles. Most roads should be wet After 10 AM until 4 PM, then back to refreezing this evening.